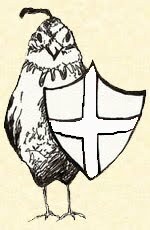 The Daily Quail: You know what really grinds my gears? Different and wrong they are, those black shrouds. What are they saying about us underneath them? What are they plotting? What are they building in there? I don't even like the word itself. Burkha. Like the illegitimate lovechild of a burger and a gherkin. Sounds foreign, suspicious...militant. Ghurka. Burk-aa. Ew. So anyway, my friend Jane* was on the train the other day when who should she find sitting across opposite her? Only another bloody Islam wearing one of those Burkhas, 'with only her heavily made-up eyes peeping out'. Cuh, how's that for hypocrisy? All dolled up to the 9s with makeup and Lord only knows what else, pretending to be covering up for modesty's sake (or Allah's, you don't know with the Islams) but dressed to kill underneath the Burkha, I'll bet. Only she didn't have a ticket did she? Hardly surprising, they expect everything for free over here, those Islams in their Burkhas and turbans. Ticket inspector asks to see her ticket. Jane had already shown him hers, with a flutter of the eyelashes to distract him from the fact that her season pass had expired. 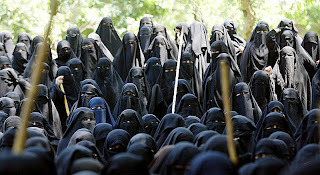 But this Islam in her Burkha, she's all 'Oh dear, I must have left it at home...I forgot to buy one...a duck swooped from the heavens and took it while I wasn't looking...Oh, by Mohammed's beard, don't blame me Mr Ticket man'. You know how they are. But you'll never guess what happened. It worked! The guard became nervous as the Burkha presented herself as an innocent in a society she didn't understand. Instead of issuing a penalty fine, he backed off, shrugging his helplessness at the other passengers, while she (or it) sat there laughing no doubt underneath her veil, yellow eyes darting this way and that mocking all the hardworking, taxpaying white English chumps who bothered to buy a ticket. That's not it though. Imagine Jane's surprise when she got off at the same station as the Burkha and saw this 'penniless innocent' whip out a credit card from under the folds of her dress with which she promptly bought a Tube ticket. She might as well have stuck a big brown middle-finger up at Britannia herself as she floated out of the station. Jane was so incensed she sent me a text message, explaining what she'd witnessed. It said: 'Attack of Burkha Rage. Grrr.' Too right. Bloody Burkhas. Different. Bad. I couldn't believe it. It's obvious that PC madness and multicultural liberalism have gone too far when normal British people will take the side of some Islam in a Burkha over an indigenous British journalist! Oh, I could have screamed. Great post. It's clear that Allison Pearson is morphing into Lynda Lee (Potty) Potter who waged a one woman war on fat (ie over size 8) celebs, women who didn't know their place, Jenny Foreigner and Career Women just like er . . Allison Pearson. I went right off her when she wrote that horrible poisonous piece about Princess Beatrice having the nerve to be size 14 and wearing a bikini. What a 'shame' it was that this girl had inherited her mother's 'thunder thighs' quoth Pearson like a bullying locker room teenager herself. Well I've met Ms Pearson and she's no stranger to the chips herself. But cheer yourself. It's apparently miserable working for the Mail. People live in fear of Dacre and prefer not to take promotions if it means actually having to deal with him.